White Mountains, New Hampshire, USA. Photo by Jason Ford. Vacation season is here, and schedules are getting blocked out left and right. 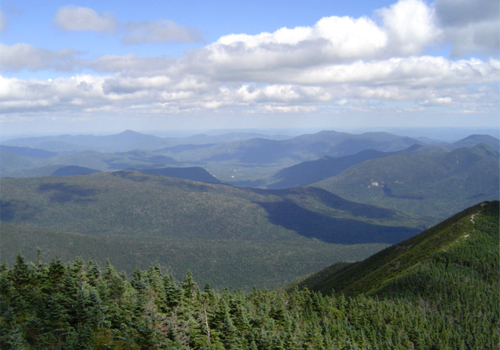 While some folks may be heading off to exotic places or taking lengthy excursions closer to home, I’m planning something in between: a week-long hiking and camping trip in scenic New Hampshire and Vermont with a good friend. It’s partly exotic, to me at least, because it involves sleeping outdoors in a tent, but it’s more or less within manageable driving distance from home (which in this case is about 330 miles). I’ve been quite anxious to get out of this area for a while. Nothing like a few days in the mountains to “detoxify.” Besides, I can’t even remember the last time I saw a night sky filled with nothing but stars. It’s too expensive to fly anywhere interesting. Better luck around Christmas time, I hope. It’s too expensive to do much of anything these days. Hiking and camping are relatively inexpensive activities, yet the rewards are plenty. I enjoy hiking very much and haven’t done it in years. I get to spend quality time with an old friend, who happens to be a formidable outdoorsman. I want to do something different, and even partly unplanned. Part of this trip we’re going to play by ear, which makes it all the more fun. Of course, there were many other great vacation ideas I considered, but for right now, this suits me just fine. Maybe next time, if all goes well, I might do the same. UPDATE: This comic/infographic pretty much sums up the vacation experience.